Gluu Server components have cryptographic keys and X.509 certificates that are stored inside thechroot. Details for certificates associated with each component are provided below. 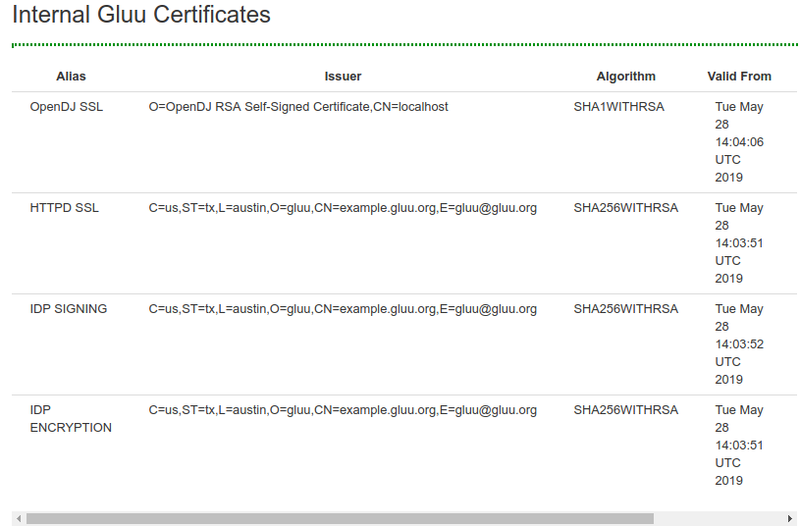 The following certificates are available in the /etc/certs folder. The certificates for Passport authentication are passport-rp.jks, passport-rp.pem, passport-rs.jks. The SCIM certificate is named scim-rs.jks and the OTP certificate is named otp_configuration.json. Additionally the following json files are available which are used in different custom scripts for multi-factor authentication. Certificates commonly used for SSO typically have a short expiration date, and can now be easily viewed and downloaded in oxTrust. Navigate to Configuration > Certificates to access these certificates. The certificates must be manually updated from the /etc/certs/ folder. There are many tools that can be used to update and renew certificates. By default Gluu uses OpenSSL. If you have questions about using other tools, like Let'sEncrypt, check the Gluu support portal for existing threads. If there is no existing information, sign up and open a ticket. The private key cannot be password protected, and the public key must be base64 X.509. Please backup your full /etc/certs directory and cacerts file under /opt/jdkx.y.z/jre/lib/security/ folder before updating certificates. Restart LDAP server, apache2/httpd and Identity Services. Log into your Gluu Server container. Keep your intermediate certificate in the file /etc/certs/. Restart the service of the httpd server.